Hat: Topshop. Shirt dress: Primark. Bag: Primark. Shoes: New look. My legs are looking too pale in this photo for my liking but I'll get over it. Just thought I would blog what I decided to pop on to travel down to London yesterday (i'll explain in a soon to be post why I am down here). I popped this outfit up on primania, which I have used for the very first time. 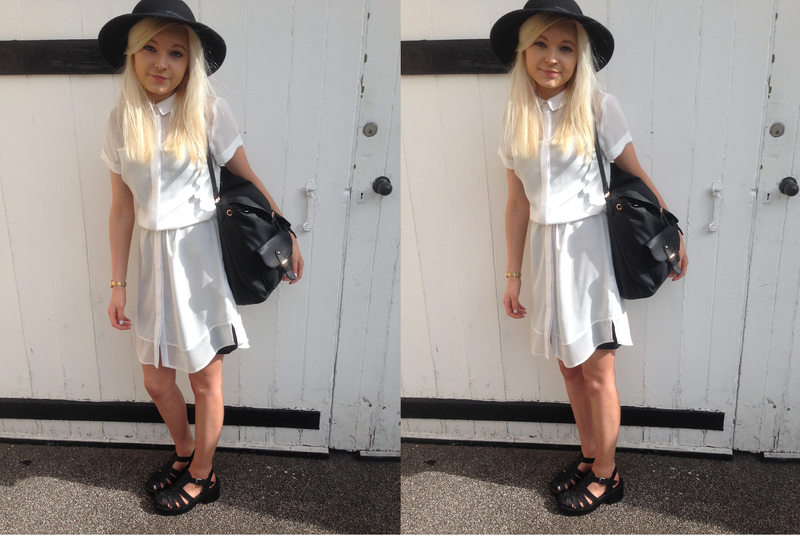 I decided to upload it on there because I just was too impressed with the pieces I bought from Primark. I love this white shirt dress (which I actually prefer to loosen down to my knee's now), and the black one strap backpack which is so easy to throw on and make any outfit casual down. So feel free to like it if you do! I am living in my chunky sandals but I have been wandering around Canary Wharf today and Camden Town and added two new shoes to my wardrobe, so I will possibly be living in some other shoe now. No regrets. Ah you look so pretty here! Really liking the floppy hat you've paired the shirt dress with. Love this outfit a lot! Love the hat I want one like this! Also your legs do not look pale, you should see mine.